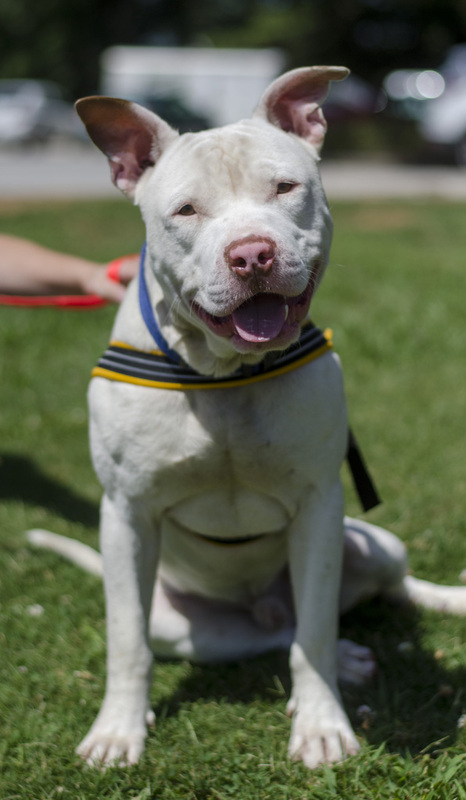 Merlin is a 1 year old American Pitbull Terrier mix, but don’t let his breed and solid build fool you. This guy is a total push-over. Like a marshmallow, Merlin is soft, squishy, and sweet. His short white coat and pink nose make him a standout in any crowd; however, these physical traits require him to be mostly an inside dog. No one wants a burnt marshmallow. Merlin happily greets all people, but when it comes to other dogs, he’s a ladies’ man through and through. Merlin loves to play and is best paired with a medium/large female doggie friend. As far as cats go, he doesn’t understand the purpose of the feline species, so cats are a no-no. Come meet this powder puff pooch and let him sweeten up your life. 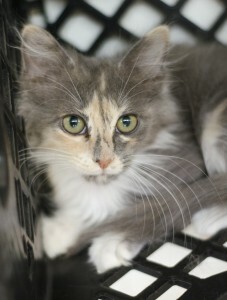 Rose is a Domestic Long Haired kitty who has overcome the odds. She came to the shelter as tiny kitten only weeks old. Rose battled illness, and with the will power and stubbornness of an ox, this little baby is well and has grown into a beautiful, 5 month old, young cat. Being a Dilute Calico, Rose has a pattern that is as unique as she is. Despite the hectic lifestyle all around her, she has kept a very calm demeanor and her spirits high. This sweet girl has been cooped up too long and dreams of a home where she can stretch her legs and fill your heart.